PingChat! allows you to message your friends with an iPhone, iPod Touch, or iPad. It uses a unique Ping! ID and sends messages for free using your existing data plan (3G/Edge) or Wi-Fi when available. Soon PingChat! will be available on Blackerry and Android. Send and receive SMS, photos, videos, and more. 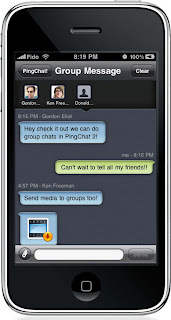 PingChat! uses push notifications to make messaging to mobile devices quick and simple. Ping a group of friends with a single message. Your chat history will display everyone's reply. Link your friends to your address book to view their contact photo. Enjoy unlimited media sending with photos, videos, voice notes, contacts, and maps! Don't forget about emojis - PingChat! also supports fun smileys and other emoticons. Get confirmation when your pings have have been received. The message is confirmed right on the message. You won't have to guess if your friends got your ping.